Back in the summer I did a workshop at the Vintage Fashion Guild on the subject of women’s sportswear. At the time I just sort of skimmed over skiing, as it was swimsuit season and that was what everyone seemed to be most interested in. But I promised myself I would investigate ski clothing more closely…later. 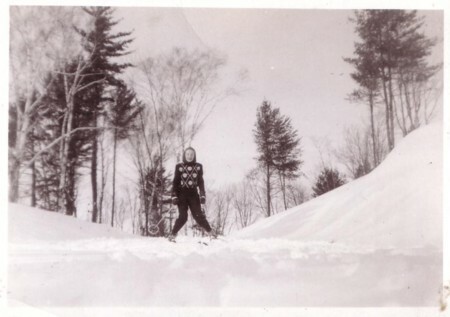 Well, the Sonja Henie ski suit I posted about Wednesday was enough to rekindle my curiosity about how ski clothing actually evolved, and I’m pleased to share the results with you. Skiing as a sport emerged in Northern Europe in the late 1800s, but it was not until the 1920s that its popularity was firmly established. 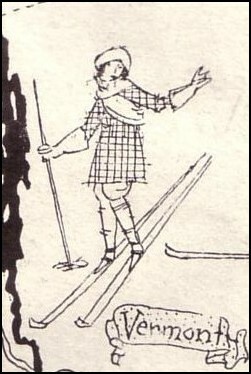 Early women skiers wore divided skirts or knickers under tunics, or even under a skirt. But by the late 1920s, after skiing became an Olympic sport and was growing in popularity, women began wearing ski trousers similar to those being worn by men. These trousers were tucked into the tops of their boots and secured with gaiters. This was worn with a long matching jacket. In the 1930s, women’s ski clothing continued to be fashionable, but it was also functionable. With the introduction of lastex in the mid 1930s, knit bands containing the stretchy yarn were attached to the bottoms of trouser legs and sleeve cuffs. There was a craze for two-toned ski outfits, with the jacket and trousers being different colors. Most of the ski suits of this time were made of a heavy wool, and they were often lined in cotton flannel. 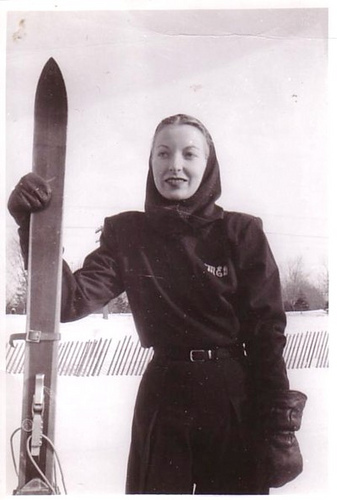 An interesting development during the late 1930s was the ski skirt, especially since women had pretty much worn some form of pants since the early days of sport skiing. It became obvious that the ski skirt was for experts only, and sure enough, on some slopes it was a badge of the Expert. 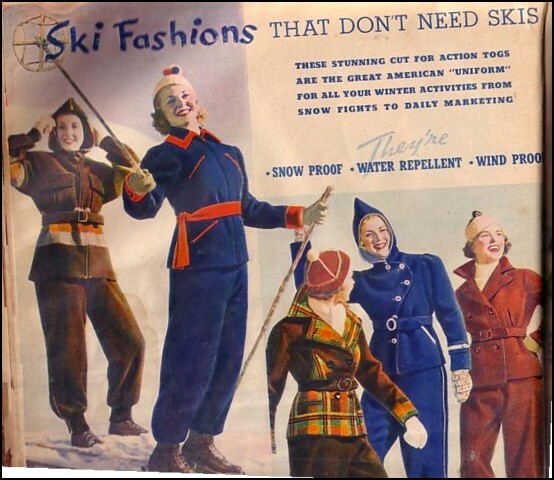 In the early 1940s, skiwear became more streamlined due to the fabric shortages of the war. This trend continued into the late 40s, when ski pants, now more commonly made from wool gabardine, became much slimmer, and often had zippers in the lower legs to allow for better movement on the slopes. 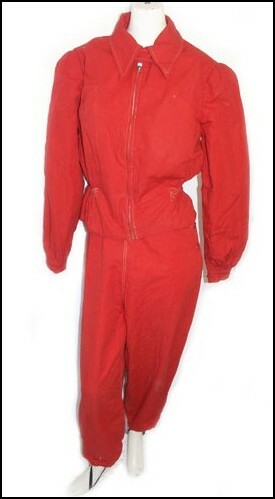 Gabardine ski suits were often two-tone, and the jacket was commonly reversible with one side matching and the other side contrasting with the pants. Colors during the late 1930s through the end of the 40s were generally somber – browns, greys and dark blues – but were accented with bright yellows, oranges and reds. Skiing became really popular in the US in the 1930s and 40s, partly due to hundreds of Austrian skiers leaving Europe when faced with the German take-over of their country. Think Von Trapps in The Sound of Music. They ended up in Vermont in 1942, where they established a music lodge at Stowe. Many of our country’s ski resorts were founded in the same manner. After the war, skiing continued to grow. 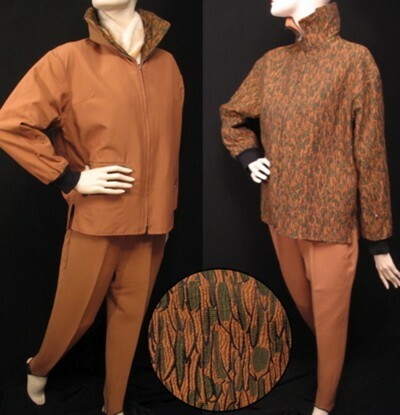 In 1949 skiwear maker Claus Obermeyer of Austria introduced a quilted parka that had insulating layers. Wool was no longer a necessity, as the outer shell could be made from the new, fast-drying nylon. During this time color became more important. Emilio Pucci began his long design career by designing colorful ski ensembles for White Stag in 1949. Another important development was in 1953 when Munich-based skiwear maker Bogner introduced stretch ski pants with a stirrup at the hem. Through the 1950s and 60s, ski clothing manufacturers experimented with new, lighter fabrics that were also warm. Ski clothing became lighter and more fitted to the body. It also continued to be very colorful. By the 1970s wool was rarely used in ski clothes, as synthetics ruled the day. Ski wear crossed over into street wear with quilted nylon ski jackets with zip-off sleeves that converted to vests becoming fashion items. In the 1980s, skiwear was often indistinguishable from street wear as stirrup strap stretch pants and big shouldered anoraks were spotted both on and off the slopes. Today, there is a huge contrast between what competitive skiers wear, and what recreational skiers wear. There is no one “ski uniform” like you would have found decades ago. A collection of vintage skiwear ads from White Stag. A 1960s skiing movie, and a view of early 60s ski sweaters. Good article and pics, just what I wanted — reading Louise Dickinson Rich’s “We Took To The Woods” where she says one pair of ski pants is part of her very small wardrobe, and she also mentions that they are all the rage on the “Outside” so she is also accidentally fashionable, too. Wanted to know more about that, and now I do. I’ll bring your piece to the book club. Thanks. I still own some Jantzen wear after all these years! This kind of stuff cracks me up. Styles change so much through the years. I’ve even seen some similar stuff like this on the mountain in recent years. It looks like skinny snow pants are back now too! great post! I have a blog called Bliss from Bygone days and I will talk about the origin of winter sports in Europe at the end of 1800s. Which month of Vogue is the image of the 1924 skier from? Jan1, 1924. It’s a very tiny image on a map. Thank you – do you know if the article was titled?